One of the things I’ve been pondering for some time is a quilt made with my precious stash of Tula Pink’s Prince Charming. I jumped on the quilting bandwagon long after this was the fabric du jour, but I was very lucky to find bundles of it on a couple of different sites around last Black Friday. I have a fat quarter bundle of each of the 4 colour ways, plus a yard of each colour way of the frog princes. After much pondering, rethinking and rejigging, I’ve had an idea in mind for exactly how I want to use it all for a couple of months now, I just need the time to sit down and actually make it. Come on, who else wants to actually break into their precious stash? ha ha – don't PONDer too much over this one! Looks good. i am breaking into my stash of hope valley… not sure what i will be making yet but i have a feeling i am going to love it. i can't wait to see what you make with your prince charming! Ah, Katy and her prince charming…I love the idea of this QAL but I don`t have anything I haven`t actually cut into! You're gonna need a larger flat. Giggle. Good idea – just the push we all need to use the stuff we collect but never sew with. I could but *all* my stash is precious…. I can't wait to see what you make! I broke into my Parisville…I hear Tula herself is offering a prize! Oh it's so hard though isn't it! I have quite a few favourites that I just take out and look at – did manage to finally get to grips with Terrain though, so maybe I'm getting there! I can't quite cut into my Tula yet… Maybe your project will inspire me. I joined the flickr group and am trying to decide if there is time for this and also which fabric I might be willing to cut up. Good for you to make a quilt with your favourite fabrics, I love that line and had a bit of it for a while. I used much of it right away so it never got to the hoarded stage. Not me. I'm up to my eyes in bears. I have a large stash that is there for when I can't make bears any more, and when I don't know what to do with myself…???!!! I can't see that ever happening. Do it. Do it do it do it. Imagine how happy you'll be when you have a quilt finished with your precious fabrics. Wouldn't that rock? Get to stitching, my friend. Katy, I have a stash of that fabric also…I just could not get over the frogs…but not sure why..looking forward to seeing what you do with it..perhaps you can inspire me to cut into it! I think the Precious QAL is a marvelous idea! Prince Charming will be perfect for your quilt! The colors are just so pretty! I was super excited to have found some Tula Pink at the bolt end store. It was just a piece, but I love it! I have a half yard bundle of AMH Folksy Flannel that I really want to make into a quilt for myself, but I just haven't had the time to start it! Maybe if I get some more time, I can join in later. Yours is going to be great though! You're so talented and that stack is gorg! Sounds like fun.. Those fabrics look fabulous – bet you will come up with something really lovely with them. 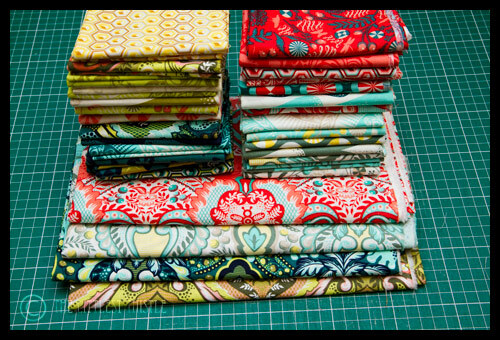 I am very tempted, but I only have one superstash fabric.. It would be rather a dull creation! It's so fun to see this fabric and will be even more fun to see transformed! Take care. Deb.